The Key of Hate is a special item dropped by Sokahr the Keywarden, who can be found in the Act Two Dahlgur Oasis. 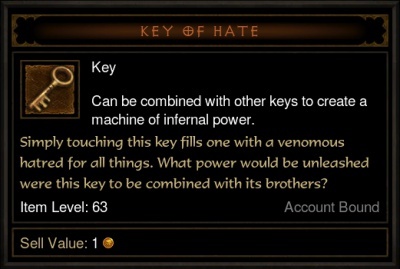 On Inferno difficulty this monster *may* drop the Key of Hate; one of the three keys required to create the Portal Device, which is required to complete the Infernal Machine event. Best method for farming this key is to enter the Path to the Oasis Waypoint and explore the entire map. Try and get 5 stacks of Nephalem Valor before tackling this elite as you will significantly increase your drop chances.